This is the world of data and each day our reliance on data is increasing at an exponential rate. With great amount of data comes ease but there is one downside to it. Where will you store an endless amount of data? We often have to save information on external hard drives, USBs and what not. It’s a lot of trouble. We feel very happy when we get access to a 1TB, 5TB or even a 30TB solid-state drive. We feel relieved that we can save so many documents, movies, music etc. in one place.Well, guess what? This isn’t a big deal anymore. 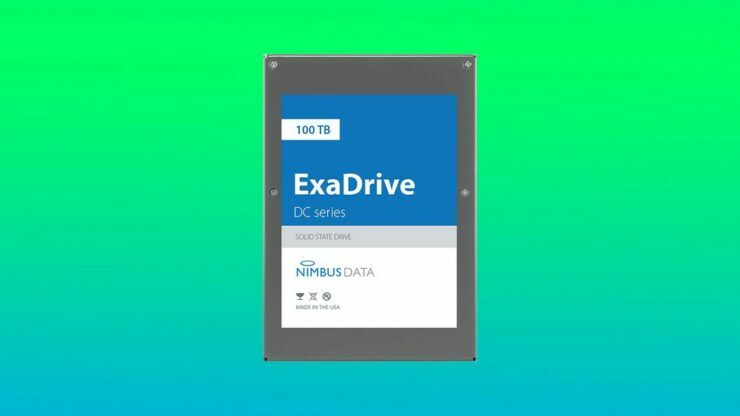 Nimbus Data just shattered a major drive record of 60TB 3.5 inch SSD drive. They just brought forward a 100 terabyte drive! Now that’s called some major data storage! Just imagine the amount of data you would be able to store. So, what do we know about this drive so far? The ExaDrive DC100 is not just the largest 3.5 inch SSD but it is also the most energy efficient drive you can find. It draws around 90% less power than other competing SSDs. Just to give you an idea about the storage of this SSD, the recently announced 30TB Samsung SSD could store about 5700 HD movies. The Nimbus 100TB SSD can store over 17,000 HD movies! I bet you haven’t even watched this many movies! So we know now that it definitely can store a lot of valuable information. What is the next question that would wonder? How much does it cost? Well, Nimbus hasn’t announced the pricing as of yet but we are sure that this bad boy will be very expensive. After all, it provides us with more storage than we could have imagined. This whopping amount storage by Nimbus may not be for individuals but I really want to get my hands on it. What about you?